I’ve been hard at work on my Stellar’s Jay sweater. The body is almost up to the armpits! I’m following my pattern as I wrote it, except for a couple (sort-of) minor details. First, I decided that I didn’t like doing the scallop rows the way I had planned it out, so I modified it a little. Now, it is slightly shallower (worked over two rows, instead of three), and I think it looks much better. I’m probably the only one who would ever notice, but I’m picky that way. Second (and this is a larger change), my pullover had turned into a cardigan. I don’t know what happened- I was casting on and some knitting spirit whispered in my ear that I needed a cardigan, not a pullover, and one thing led to another. I’m still following the pattern as I designed it, but instead of working the sweater in the round, I’m knitting it flat. 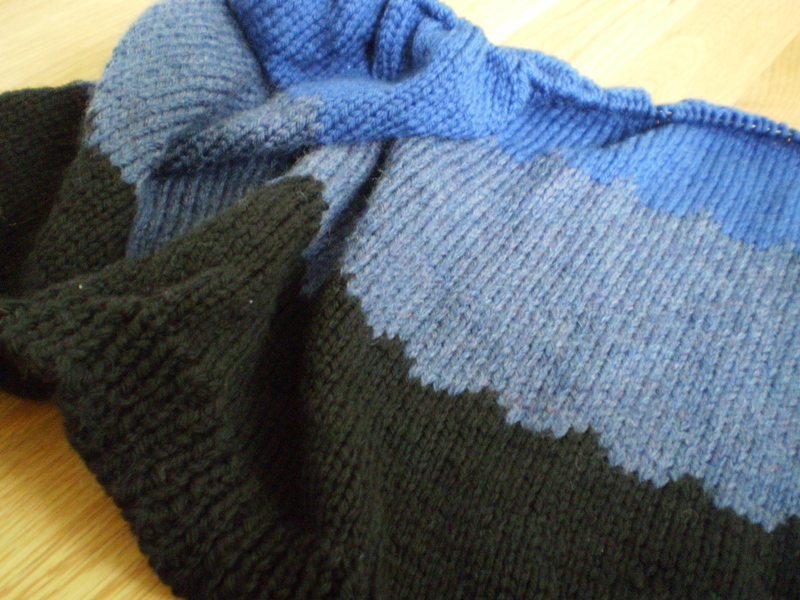 When I finish up the sweater, I’ll pick up stitches along the selvedge edges and knit on some button bands. It should look pretty good (I hope!). It’s important to remember that regardless of how much planning goes into your knitting, it’s still possible to change plans as you work. You’re in charge of your project, and being flexible when you don’t like how something is working up will end up giving you a better finished project. What changes have you made to projects as you knit them? This entry was posted in Techniques and tagged bottom up, bottom up sweater, button band, cardigan, changing plans, flexibility, knit, knit sweater, knitting, pullover, stellar's jay, stellar's jay sweater, sweater on May 23, 2014 by onemilljellybeans.